Home / Blog / Do you want to sell the freshest, most flavorful and fragrant cut basil? Do you want to sell the freshest, most flavorful and fragrant cut basil? How you grow and process fresh cut basil will impact the flavor and shelf life of the harvested product. Basil is one of the most popular culinary herbs. Whether grown as a potted crop or for fresh cut sales, basil is an herb that’s in demand year-round. Growers looking to add edibles to their product mix should consider basil to be a must-have herb in their product offerings. Clemson University horticulture professor Jim Faust said ornamental plant growers looking to supplement their crops with fresh cut basil will find some similarities with the propagation of unrooted vegetative cuttings. “The physiology of ornamental unrooted cuttings is very similar to fresh cut basil,” Faust said. “It’s a stem with a few leaves on it. The way the basil is grown is going to impact the postharvest performance just like unrooted cuttings. Stock plant production for unrooted cuttings is just as important as the postharvest handling. Faust said growers want to produce more durable cuttings that are going to have a lower water content and stiffer leaves. Faust said calcium also plays an important role in the strength of the leaf tissue. Faust said if basil is harvested in a greenhouse, the temperature of the cuttings should be reduced relatively quickly. The longer the basil remains under warm temperatures the shorter its shelf life is going to be. “When basil is harvested it should be placed into a refrigerated cooler that is maintained at 55ºF,” he said. “Removing the field heat is the highest priority. Harvested basil is going to have a longer shelf life when it’s stored at 55ºF. Faust said it is also important to harvest the basil in the afternoon. “A lot of times people assume the best time to harvest basil is early in the morning when the greenhouse is cool rather than in the middle of the day when the temperature is warmer,” he said. “That is not the case with basil. 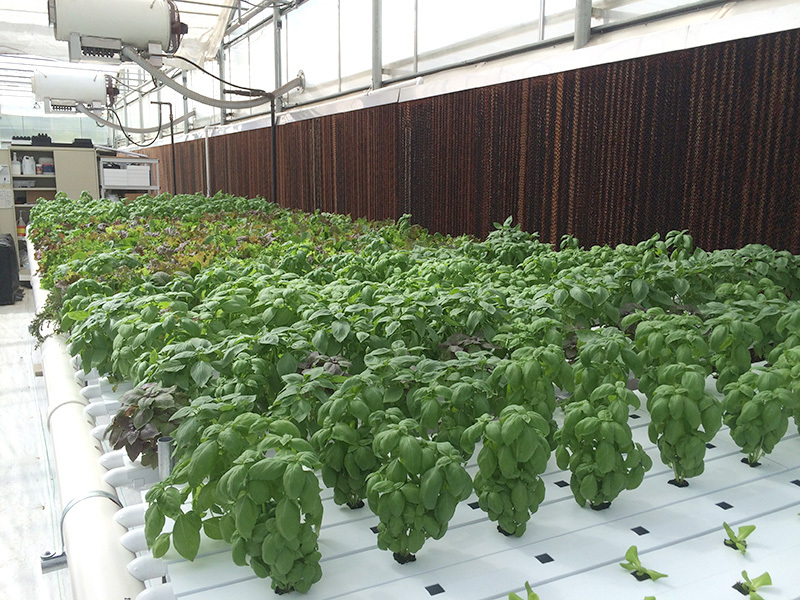 Basil’s postharvest performance improves the later in the day the plants are harvested. The plants should be exposed to at least four hours of light before cuttings are harvested. The postharvest performance of fresh cut basil improves the later in the day the plants are harvested. Faust said the temperature in the storage cooler or delivery truck needs to be monitored to ensure it doesn’t drop below 50ºF to avoid chilling injury. “Once the basil cuttings arrive at the cooler many growers will use forced air cooling, which is the same type of cooling used with fresh cut roses,” he said. “A fan pulls air across the cuttings and helps to quickly remove the field heat out of them. Faust said the way the basil is processed and washed will influence its flavor. Botrytis is the main postharvest disease of fresh cut basil. “Botrytis is ubiquitous and the spores are always going to be around,” Faust said. “As the temperature goes above 55ºF, there is going to be more Botrytis infection and a shorter shelf life. Botrytis spores are always going to be around basil plants grown in greenhouses. If the calcium levels in the basil tissue can be increased, just like in other crops, the Botrytis fungus won’t infect the plants as aggressively. For more: Jim Faust, Clemson University, E-143 Poole Agricultural Center, Clemson, SC 29634; jfaust@clemson.edu; https://www.clemson.edu/cafls/faculty_staff/profiles/jfaust. This article is property of Hort Americas and was written by David Kuack, a freelance technical writer in Fort Worth, TX. Previous post: How can sensors increase efficiency, effectiveness of your IPM strategies? Next post: How do you stop diseases on controlled environment edible crops?